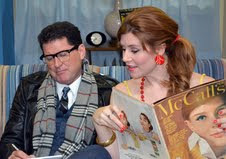 Jeff Ketterman & Carrie Cooke in Barefoot in the Park. Entire contents are copyright © 2012 Kate Barry. All rights reserved. Paul and Corrie are a couple of kids starting their life together in the middle of New York City in the early 1960s. Fresh from their honeymoon and two weeks after saying “I do,” these kids are experiencing what it’s like to be married and what it’s like to pave your own path with someone by your side through all of the bumps that might be encountered. In Barefoot in the Park, Neil Simon crafted this classic American romantic comedy in the peak of his career, having woven his wonderful humor into a contemporary statement on what it means to be in love in the modern era. In Hayswood Theatre’s new production, I noticed many strong and interesting choices made by director John Hardaway, as well as some setbacks that were sometimes out of this company’s control. What makes romantic comedies such a treat to watch is the chemistry between the lovebirds on stage. If you can make your audience believe that you’re head over heels for your lead, you have won the battle of suspending disbelief. Carrie Cooke and Jeff Ketterman prove victorious over and over throughout the production as Corrie and Paul. 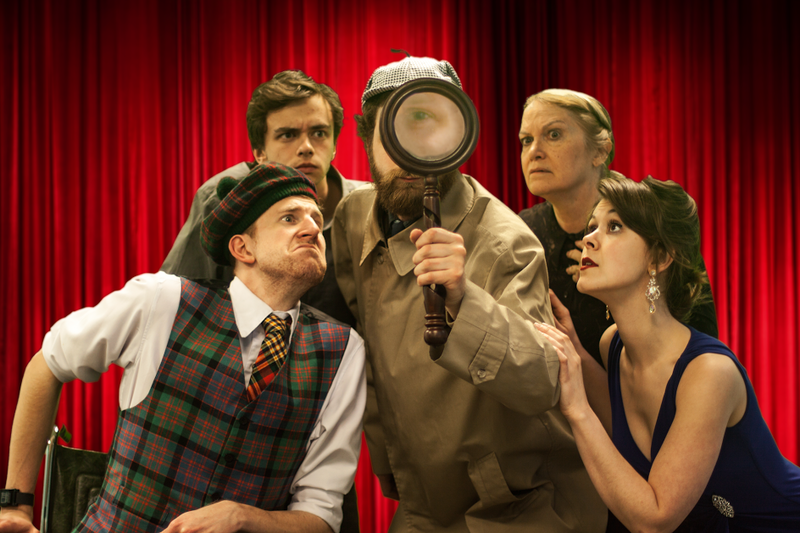 Resembling Lucille Ball and Ricky Ricardo at times, this pair of actors fully embraced each joke and gag, which made for an entertaining execution. Whether it’s the constant endless new discoveries of domestic life that lie in the way of Corrie’s newlywed passion or Paul’s “stuffed shirt” worrying, Cooke and Ketterman’s chemistry created a bright energy bolstered by an already delightful script. While this production was funny and entertaining with all of the physical humor of people walking on window ledges and arriving to the newlywed’s apartment completely out of breath after too many flights of stairs, certain drawbacks kept this performance from being flawless. Haywood Theatre is a tiny space, which means actors will be able to hear audience members and vice versa. On the evening that I attended, a fellow audience member experienced an awfully loud coughing spell throughout the duration of the play. This spell was annoying and distracting to both actors and audience members. Even though the theater is small, it would have been appropriate, not to mention considerate, for the coughing person to excuse himself/herself. In addition to this distraction, there were other weaknesses among director John Hardaway’s choices. Two moments come to mind in the second and third act. To signify a change in time in between scenes, a simple black out occurred in the middle of act two. Even though it allowed for actors to change costumes and to prepare for their next cue, the usage of a black out felt awkward and could have been better planned and executed. The other was a verbal fight between Corrie and Paul. This comedic scene falls short when both characters exit and we are left to watch a blank stage for several moments. I realize that space and resources are limited in such a venue, but the choice of taking both actors off stage put the scene at a disadvantage. Hayswood Theater did a great job with handling the comedy of Neil Simon’s classic script. The jokes were well timed and the set was adorable with vintage looking furniture and decorations. The theater utilized its resources to the best of their ability, producing an end product that was a lot of fun to watch. NextSweeping and Romantic “Widow” Proves Opera Is Not Just for Buffs! Derby Dinner Offers Tuneful, Faith-Based, Holiday Fare in "Sanders Family Christmas"
The blackout with music between Act II, Sc. 1 and Act II, Sc. 2 plus the point at the end of the show where both actors are off stage (with one saying lines from offstage) were both called for in the script. This was not the director’s choice – it was Mr. Simon’s choice!